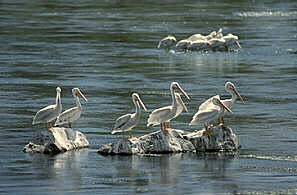 Description - The White Pelican is a huge bird reaches heights of 55-70 inches. It is white with a long, flat, bright orange bill and black tipped wings. During the breeding season a short, yellowish crest appears on the back of the head and a horny plate appears on the upper mandible. Distribution - Breeding white pelicans are found from Mackenzie, British Columbia south to northern California. Wintering grounds are from central California, the Gulf Coast, and Florida south to Panama. They prefer shallow lakes to coastal lagoons. Biology - White pelicans are gregarious, usually travelling in flocks and nesting in colonies. 1-6 white eggs can be found on a low mound of earth and debris. Pelicans do not dive for food but cooperate to surround fish in shallow water where they scoop them into their pouches. In recent decades the number of white pelicans has dropped drastically because of the use of pesticides, human disturbance and the draining of wetlands.